July | 2010 | Professional Use Only, No Warranty. 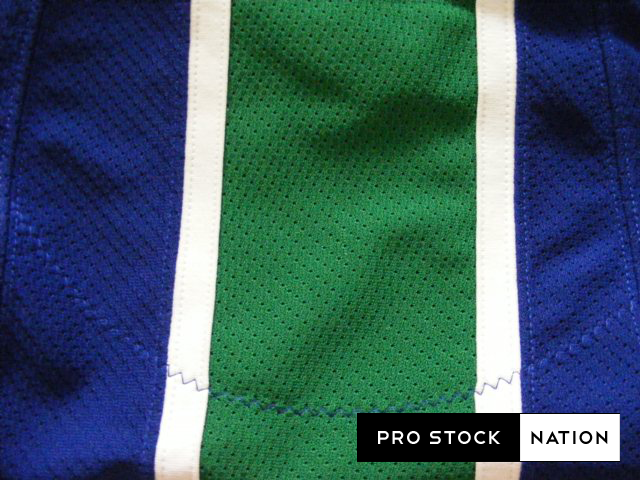 Well readers, for my first post here on Pro Stock Nation I’ll be focusing on one of my passions; jerseys. I won’t be doing a review, instead I’ll show you the jerseys the pros wear, explaining the differences in the two types of jerseys currently worn in the National Hockey League. The two jerseys I will use for examples are both NHL game worn, making them pro stock through and through. 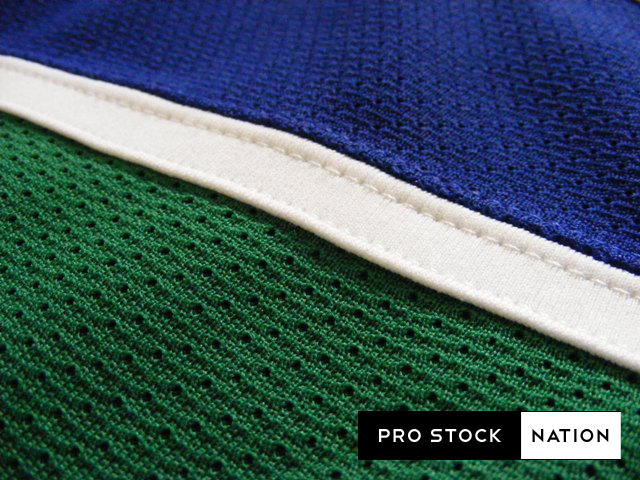 Reebok began supplying NHL teams with the RBK Edge (now dubbed the Edge 1.0) jersey starting in the 2007-2008 season, these jerseys were tighter fitting, and featured a new fabric (X-trafil) designed to reduce water absorption and thus allow jerseys to dry faster and remain lighter. In turn the hope was that players would be faster and more manoeuvrable. As the season went a long players began giving negative feedback about how the new Edge jersey performed. Players complained of sleeves that were too tight, durability issues, and that the jerseys were too heavy. 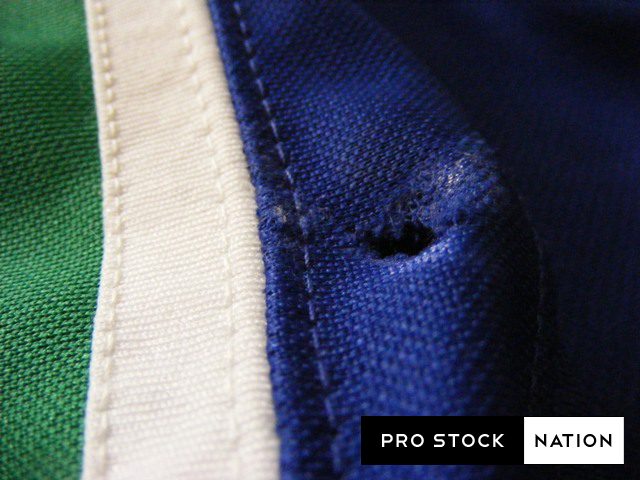 By January 1st 2008, Reebok had come up with a new model of jersey to replace the maligned ones in circulation. These new jerseys were never given much publicity as Reebok wanted to hide the fact their first generation Edge jerseys were not received as highly as hoped. The Edge 2.0 jersey featured bigger sleeves, replacement of the play-dry material, and a return to the pre-2007 style of jerseys with double elbows. 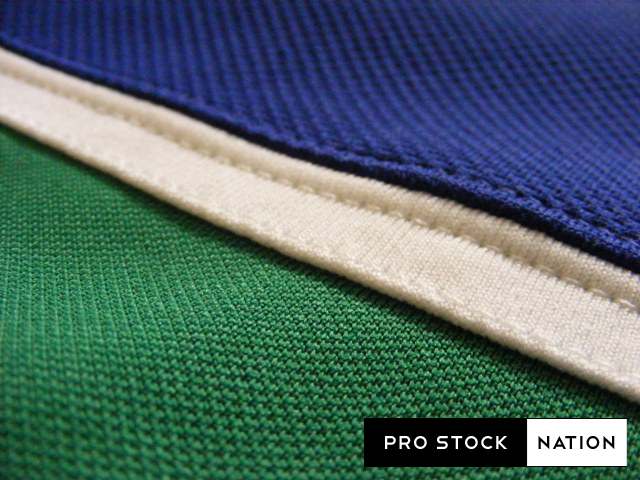 Both styles of jerseys are still used by NHL teams, although the newer 2.0 is seen in much higher numbers. Numbers from the 2008-2009 season show approximately 80% of the league uses the Edge 2.0. 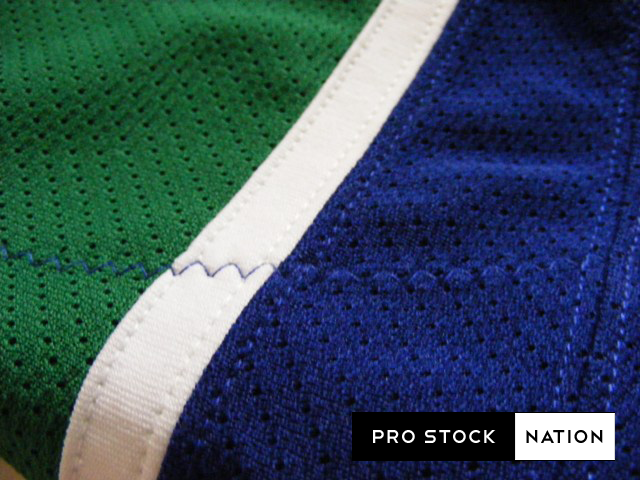 The differences are relatively superficial to anybody who isn’t actually wearing the jerseys, but for professionals the little things make all the difference in performance. As a jersey enthusiast I prefer the traditional feel of the Edge 2.0 jersey, but as a collector I also value the rarity of the Edge 1.0 as it’s usage becomes less and less common. I hope you learned something new and enjoyed the read. Next time I’ll do a review. Bauer X60 is all I’ll say about that though. Stay tuned for our review of these monsters. As a glove enthusiast the main criteria I look for in a glove includes the outer shell being constructed of Tufftek and plastic inserts. After switching over from leather gloves I’ve had no complaints about Tufftek. It’s lightweight, breathable and not to mention it won’t crack over time like leather tends to do; and personally I prefer the look of Tufftek (Nylon.) There are plastic inserts all over this glove which offer extra protection while minimizing added weight. Oh, and I’m also a sucker for traditional 4-roll style gloves. First off you’ll notice these gloves have the larger Warrior font package, there is an extra charge for this ‘option’ when customizing. I prefer very plain gloves so this solid blue color with white graphics looks really appealing to my eyes. Aesthetically there’s not much else to say other than the graphics are still screened on like the retail models. Mesh gussets are my new found love. 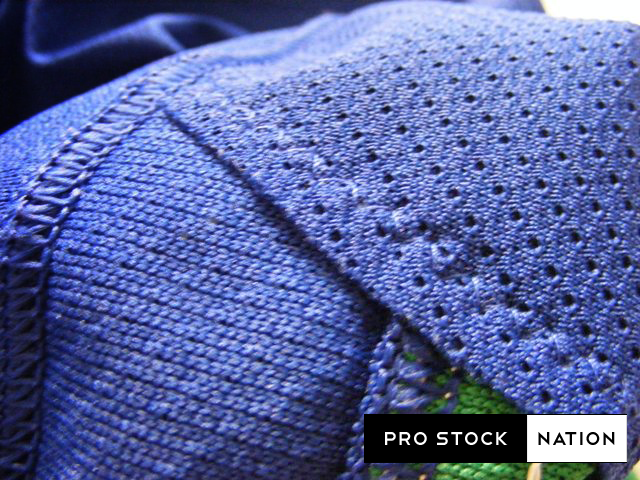 I prefer mesh over any material on most retail hockey gloves like Nash or MSH2 because it allows for much more airflow. One of the least desirable feelings in hockey is to have your hands soaked in sweat inside your gloves while you’re playing. The mesh gussets really help with keeping your hands cool and to an extent, dry. But what really sold me on these gloves were the digital palms. This being my second experience with digital (first was on a pair of Eagle CP94), I had to have them. For those who have not heard of digital, it’s the thinnest performance palm available on the market, similar to the palm you’d find on a pair of golf gloves. Digital palms are a performance palm and is not warrantied and that’s probably why retail model gloves don’t come with them. If you want to give digital a try you can always re-palm your existing pair or go the custom route. All other palms, including the oh so popular MSH2, will feel thick after using digital. As with all good things there are a few cons as well. To extend the life of your investment you must be extra careful compared to other palms. If you’re particularly hard on your gear or frequently forget to air out your equipment then digital is not for you. Since the palm is very thin it rips easier than other materials. I’m really easy on my gear and I’ve used these gloves for about a year and they are holding up fine. Avoid sharp edges on the knob of your stick and NEVER wipe your skate blades with these gloves (This is a given with ANY palm.) My previous pair of digital palms lasted a year and I purchased them used. Make sure you dry them out as soon as possible otherwise the palms get rather crusty, a rather unpleasant feeling the next time you put them on. The Silver Shield lining is a fantastic feature to have, especially in the fingers (next paragraph will explain why.) It wicks away moisture and prevents bacteria from growing. I played outside in 30°C weather and my hands were amazingly dry. I played later in the week in similar weather with my Eagle CP94 and my hands were soaked. The lining dries much faster than most gloves so it’s ideal if you have more than one ice time in a day. The Franchise is one of the more expensive gloves on the market but it’s worth it. If you’re interested in a pair I’d skip the retail route and go custom. I’ve tried on some retail versions of this glove (without Silver Shield in the fingers) and the glove feels very abrasive against my knuckles. I’m sure with a bit of breaking in the gloves will feel fine but mine felt comfortable the first time I used them. Customizing a pair of gloves will also give you the opportunity to choose palms and gussets not available on a glove off the store shelf. I would suggest mesh gussets like I have with this pair but the palm should be chosen according to the level and frequency of hockey you play. If you can afford to buy these gloves, go for it. Few gloves can rival the Franchise especially when so many gloves are being made overseas now. You are currently browsing the Professional Use Only, No Warranty. blog archives for July, 2010.